This American inspired Cream Cheese Frosting is just a little less sweet than a Classic Vanilla Buttercream. It is essentially just buttercream made with half butter and half cream cheese but the result is creamy, fluffy, and light. This has become my frosting of choice, not just for Red Velvet Cake and Carrot Cake (the more traditional vessels for this treat) but in Victoria Sponge and piled high on top of Vanilla Cupcakes too! 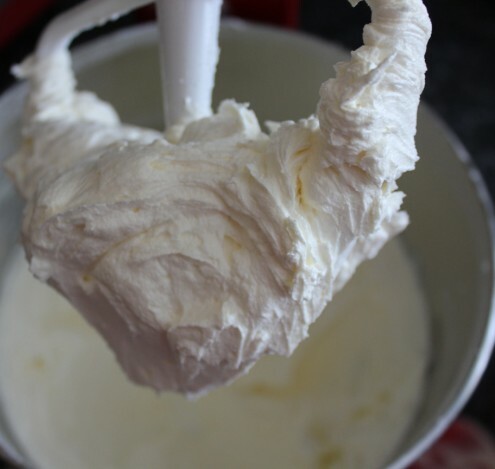 Cream the butter in a freestanding mixer for 2-3 minutes until soft. This can also be done using an electric handwhisk but you will need some mechanical assistance here! Add half of the icing sugar and mix until combined, then add half of the cream cheese and mix again. If you find that the mixture has gone a little runny, add a little more icing sugar. Repeat this until all of the ingredients are thoroughly combined and the frosting is light and creamy. If you can give the frosting a good 5 minutes, the extra air will make it super light and fluffy.